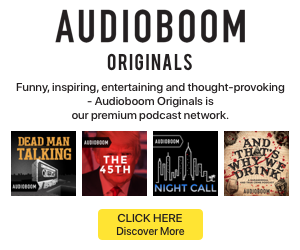 Podcasting has come a long way in attracting a dedicated, passionate audience with several unique traits, but there is still progress to be made in reaching the mainstream American listener. That’s the narrative laid out today in the Podcast Consumer 2018 report from Edison Research and Triton Digital. Ever the congenial host, Edison VP Tom Webster presided over the presentation. People spent an average of 4 hours listening to audio in the latest results, a figure that has stayed generally level over the years. 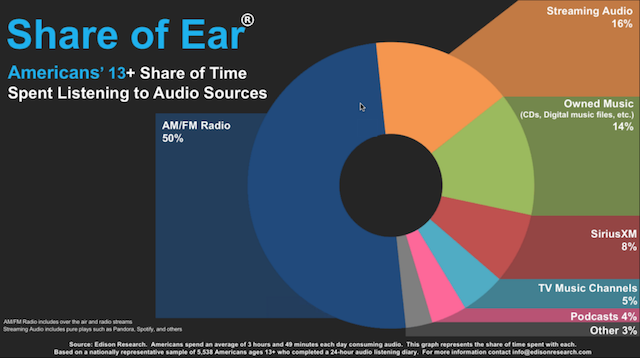 AM/FM radio content holds half of the share of time for the average listener. Streaming music took a 16% share, while owned music’s share dipped to 14%. Podcasts took 4%. 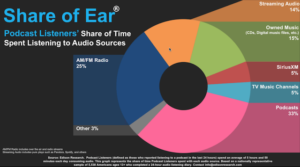 When just looking at podcast listeners’ share of time results, podcasts have dethroned AM/FM radio to take the largest slice of the pie. 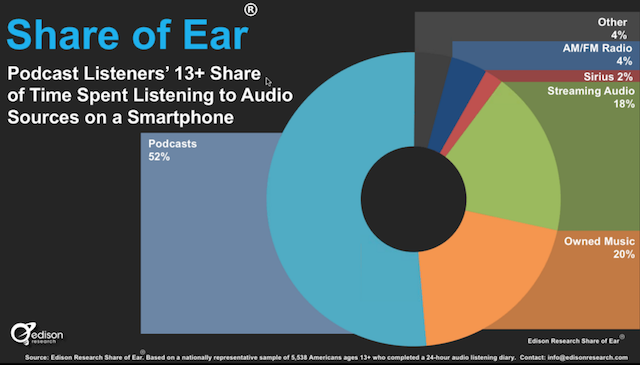 Podcasts took 33% in that share, while AM/FM radio is at 25%. 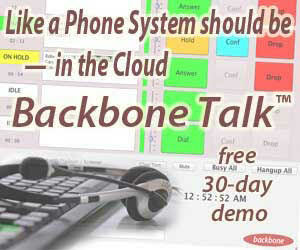 Next he broke down the trends of devices used. For the overall audience, AM/FM radio receivers are the top source. For podcast listeners, mobile devices are the top source, with computers and AM/FM receivers tied at a 20% share. 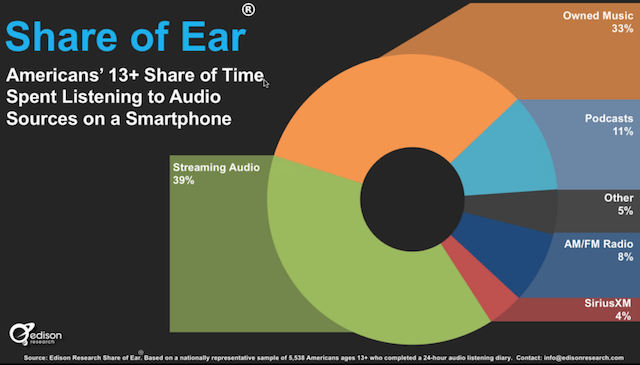 Streaming audio tops the type of audio listened to on smartphones for the general audience with a 39% share. Next came owned music with a 33% share, followed by podcasts at 11%. For podcast listeners, though, the chart looks quite different. 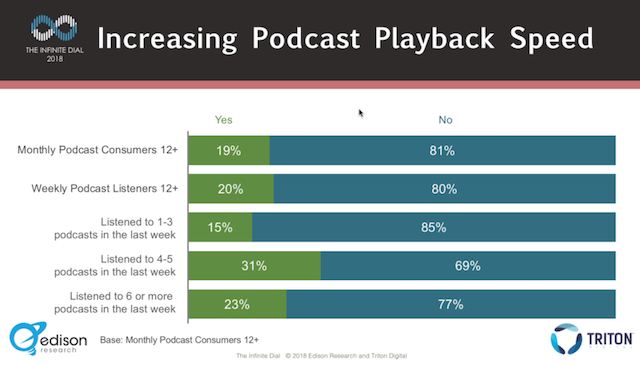 Podcasts are responsible for more than half of that group’s listening on mobile devices. Owned music was again in the second spot with 20% share, while streaming dipped down to 18% within the podcast listener demographic. The two charts follow for a side-by-side comparison of how distinct the listening habits are for these groups. 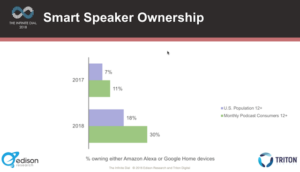 The webinar kicked off with several slides and statistics from the Infinite Dial 2018 report Edison and Triton put out earlier this year. 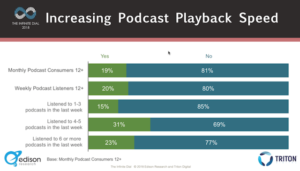 Webster offered an overview of the latest major data points for the contemporary podcast audience. He noted that there is still a large gap between the rates for awareness of podcasts and for people actually tuning into a show. He pointed to some areas where podcasts’ monthly listener audience has been smoothing out its early leanings toward a twenty- and thirty-something male audience. The gender line is nearing parity, and there’s growth across all age groups. “I still think there’s tremendous opportunity in 55-plus,” Webster said.